This was a killer. As one of the old guard, it fell to me to throw out the oldies and let them shine. If you asked Zz, I went back to him many a time trying to get a feel of what was out there before making my choices. Cheating a little I know, but that allowed me to throw out less conspicuous nominations for consideration. And hey, the larger the audience for them, the happier I am. After nominating however, I strangely found my list filled with Yoko Kanno pieces. Go figure. It starts with dodgy choral synths and corny percussions. Then, a generic guitar riff comes in alongside piercing synthetic pipes. Yes, pipes. But once the strings make their appearance, the beats get heavier and with it, a smorgasbord of sound hits you like a hammer and boy, is it good! The vocals aren’t the greatest, and there’s a simply laughable rap at the end, but it’s totally forgivable as the song just soars and keeps soaring for the full six minutes. Definitely one I want people to listen to at least once in their lives. It’s worth it. Monster has been a joy to watch. It weaves a story spanning ages, with believable characters thrown into perilous situations. Not many make it out alive. The ending song wants us to remember these characters. David Sylvian’s voice is both sombre and gentle, with quiet strings fluttering behind it. Which is what I love about the song; it never really goes into a melody, but rather… hovers. There are also touches of electronic sounds as ambiance and the effect is beguilingly serene, especially juxtaposed against the violent ends some of the characters face. “For the Love of Life” is one of those songs where I put on the headphones on a bad day and just… drift… away… What’s even more amazing is that the great David Sylvian especially wrote this song for the anime! This one’s quiet and gently mischievous, almost like a lullaby. Akino Arai’s vocals and those understated harmonies simply resonate throughout the song, making it a very hypnotic listening experience. And I simply love that beat. One of the classics to put up on the podium. One of the most important anime songs out there, one that probably works better in the anime’s context. But oh what a scene of sight and sound! Explosions, lasers, space-fighters, death, love, desperation, unity and triumph, all packaged in the greatest six-minute love song in the universe! PROTOCULTURE!!! Probably one of the most perfect anime openings ever. And definitely one of the hardest ones to perform. Kanno’s composition starts with a quiet, lilting guitar, couples with Maaya Sakamoto’s vocals, before fully diving into the urgent chorus of quite epic proportions that refuses to stop. It just keeps surging forward until finally, the song ends, as gently as it began which, when paired with the animation, makes for a fine title to get my full points. One of the things that many of us on the team have in common is the tendency to go after tracks that are less appreciated, but are still worthy of consideration. Unlike maskerade, whose picks tend to be from older, more iconic titles, mine runs the gamut of genres and years; shmaltzy ballads lie alongside squealing energetic fare (classy squealing, mind you!) which are nestled comfortably amidst psychedelically distorted vocals. Together, my nominations bring together a bevy of a “who’s that” of the anime music scene rather than a “who’s who.” So though their names might inspire a blank stare from those who don’t recognize the titles or songs, I love them and I hope that, out of the ones that qualified, that you’ll love them too. Not many people saw The Cat Returns, but it’s definitely enjoyable as both a film and a musical experience. For the ending credits, Ayano Tsuji’s vocals come across as being delightfully charming. Sure, there aren’t any pretentions or attempts at anything more beyond creating a solid, catchy earworm, but the result is solid and fun. I particularly love the way it bounces along, with its soothing melody and lyrics which I feel we don’t get nearly often enough these days. OK, so maybe there’s a sense of old fartness within this soul after all. But how can that be? I haven’t even seen Nadia. Well, this song managed to claw its way back up into my data banks when I gave Platina Jazz vol.4 a listen, which, in turn, jogged my memory of a misspent youth. My first exposure to this classic had been during the phase where I was playing Stepmania and loaded my stepfile list with anison. “Blue Water” immediately stood out as being one of my favorite tracks. The sense of joy and the energy that comes forth is the big draw here, earning it a spot on my nomination roll even if it ultimately didn’t make it into the tourney. As long as I live, the Japanese artist that I’ll use as a measuring stick for quality will always be KOKIA. My first experience of her lush delivery had been through her collaboration with Akira Senju on the Red Garden soundtrack but the song that really won me over was her stunning performance on “Ai no Melody,” Gin-iro no Kami no Agito’s ending theme. The way her voice gently touches upon the heartache is especially poignant and I find myself completely won over by the melody and KOKIA’s expression which yields an eye-openingly poetic package. I don’t know whether people have seen this anime, and yet, a not insignificant number of people have heard of this song. Well, for me, when I first got into anime way back around… 1998? a friend showed me Himiko Den’s opening sequence and this song became one of the first to catch my ear, even if I ultimately never saw the anime. Sure, prior to that, I’d been exposed to classics like Evangelion’s “A Cruel Angel’s Thesis” and Record of the Lodoss War’s “Adèsso e Fortuna,” but this song stubbornly stuck around. I blame Yuko Sasaki’s delicateness during the verses and the outpouring of energy during the chorus for doing me in. Nostalgia might play a factor too, but I’d like to think this song stands the test of time. Back when I was a full-fledged lurker on a messageboard, some moderator decided to poll people on what their favorite anime OP/ED theme was. 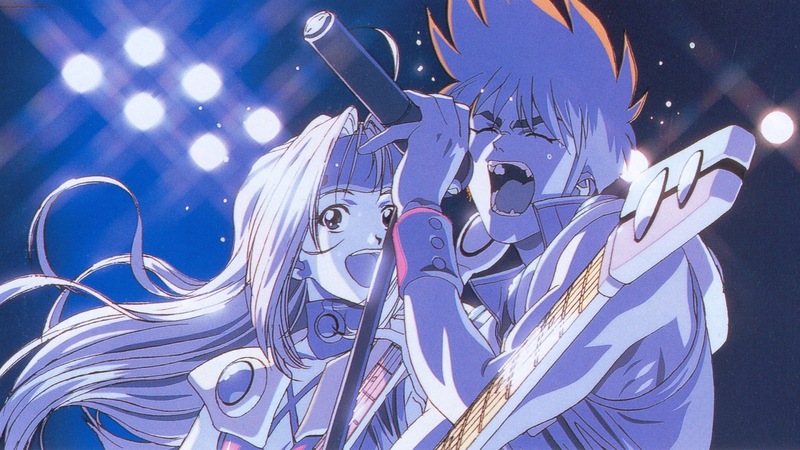 People moaned and groaned that it’d be nothing more than a contest where “A Cruel Angel’s Thesis” will go up against “Tank!” But much to everyone’s surprise, FMP Fumoffu’s OP theme was what took the top prize. Out of Mikuni Shimokawa’s repertoire, this was the one that really captured my attention (I suppose the awesome Kyoto Animation opening helped too). Since then (in terms of my anime viewing, chronologically speaking), I’ve heard her other fare such as the opening to Kino’s Journey, but it still can’t displace “Sore ga Ai Desho” from the top of my Mikuni Shimokawa favorites list. Can I just say that Zzero is the best person ever for having Kaze ni Naru on his list? I absolutely adore that movie! Anyway, my top 15 was as difficult to construct as I’m sure everyone else’s was, but there were a few (in my opinion) sure-fire winners that I had to include. My tastes are pretty eclectic as far as time period and genre, I was really basing my picks off which songs I could listen to over and over again because they’re just that good (admittedly I also threw in a few just to see if they would make it at all). Here are the ones I’m most rooting for, and may the best theme song win! I’m a little late to the party since I watched Trigun for the first time just last year, but I was immediately captured by the very unique soundtrack, particularly the opening. I think this was probably the first opening sequence I’d seen that had no vocals but conveyed so much action and really gave you a feel for the show without having to physically say anything. The mix of hard guitar and bongo drums create a really interesting blend, and much like the series itself, the beat always keeps you guessing. In addition to the rest of the soundtrack, the opening really portrays that strange alternate western image that’s present throughout the show. This is a surprising entry on my part, because although I’m completely in love with the show, I haven’t really paid attention to SAO’s first theme song before. But as I was looking through different openings trying to figure out which to nominate, I found myself putting this on repeat several times. It has the constantly driving beat that I’m so fond of, the kind that’s so infectious it sets your foot to tapping involuntarily. I’m glad to see that SAO received a burst of popularity gain recently (did anyone else notice the sudden influx of Kirito and Asuna cosplayers? ), and I hope for an equal rise in appreciation for the opening. This was one of those shows that ripped my heart out and waited until the very end to put it back together again. I almost can’t listen to the opening without tearing up, both because of lingering emotions and because it’s absolutely gorgeous. Lia’s trembling voice over a synthetic mix of piano and soft drums gives it a very ethereal, whimsical feel while planting images of white wings and sunrises in your head. Quite a hopeful opening song for a series that ultimately shattered my emotions, but it’s a really beautiful song in its own right and thus deserves a high spot on my list. If you know me at all, you’ll probably know how much of a Pokemon fanatic I am, so of course one of the theme songs had to make it on here. The difficult part was choosing which to nominate. I could have gone with the well-loved American opening to the first season, but I decided to nominate its lesser-known Japanese counterpart which I discovered several years ago. The two are very similar, sharing an action-packed electric guitar part and lyrics that voice lofty ideals, but I feel that this version deserves a lot more recognition than it currently receives, so I’ve chosen it as my “lead player” for getting a Pokemon opening into the game. Speaking of lesser known titles, guess who’s sitting pretty at number one on my list? I myself hadn’t heard of Polar Bear’s Cafe until my friend recommended it to me about two years ago, but the opening theme quickly became one of my favourite songs of all time. Like the series, it’s an upbeat, “feel good” song with a catchy percussion line that just makes you want to dance. Polar Bear’s is a very relaxed, slice-of-life anime that I tend to fall back on if I just need to watch something light-hearted and not emotionally straining (unlike everything else I watch), and the song similarly serves as a pick-me-up whenever I’m feeling down. It’s a really great song and I hope it does well in the tournament! Somewhat related to For the Love of Life: I almost nominated Grain. Ai no Melody was on my shortlist after it featured in MALKeionbu, as were other Kokia songs: Karma and Fate, but I thought Ai no Melody was a shoo-in and maybe even Fate. Are these all songs that didn’t make it in? Are you guys gonna reveal your full lists at the end of the tournament? Groovin’ Magic was a pretty safe bet on getting in. Ai no Melody? If it weren’t for three of us, we’d see that song go by the wayside for sure. I’d say it was a courageous effort for certain definitions of courageous. As far as internet nominations go anyhow. On my list, Ai no Melody, Sore ga Ai Desho, and Himiko Den made it into the voting stage. We’ll actually reveal the raw tournament data in a few days and you can kinda crosscheck the rolls with this post (though if you want a full rundown, I suppose we can do that too). This post format only came about since we didn’t want to tl;dr it with a barrage of nominations. Wonderful, I love raw data. At least I put GM last on my ballet. But I still regret not putting a Mikuni song on der. I kid, but only about the gal bit. There’s no gal. That said, organizing the list was very hard, and yes, there were regrets. Best not to dwell on them I’m sure there’s Mikuni love in the list so don’t fret. Show your support by voting when the time comes! Grain was a great song, but I thought Love of Life was more ethereal, spiritual even, as a better choice for the list. Nice list. I had quite a few of these on my shortlist, though none made my final selection. I especially love that Pure Snow song. Never heard it before, it would have at least made my initial shortlist if I had. I’m very glad to see, that “Nadia”, “Himiko Den” and “Polar Bear Cafe” are here. Quite unpopular, not mentioning that they aged. Good to know some people still remember and like it, like I do, he-he.